Locals gather at Shwe Sar Yar Pagoda to celebrate the annual pagoda festival and pay respect to the Shan princess of legend, Sao Mon Hla. 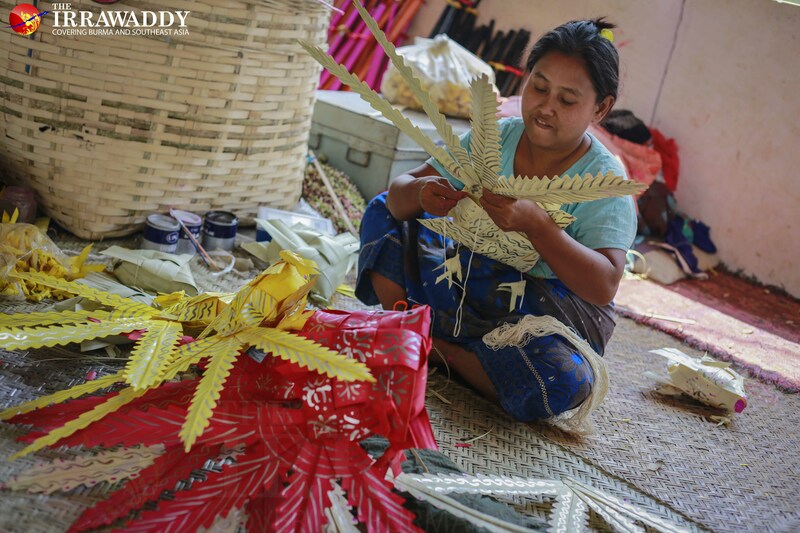 MANDALAY — Despite scorching heat, Mandalay locals gathered on Tuesday at Shwe Sar Yan Pagoda, about 15 miles southeast of town, to celebrate the annual festival of the centuries-old pagoda. 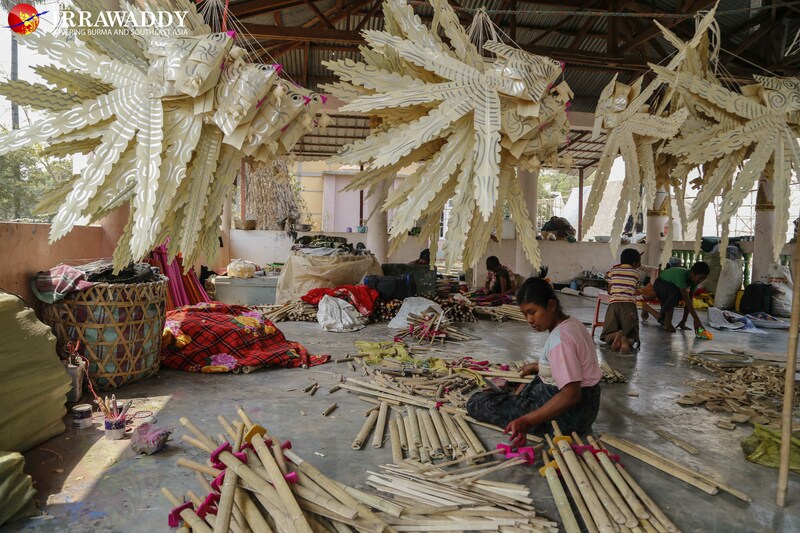 The annual festival of Shwe Sar Yan Pagoda is one of the biggest pagoda festivals in Mandalay Division and thousands of people travel from around the country to partake. 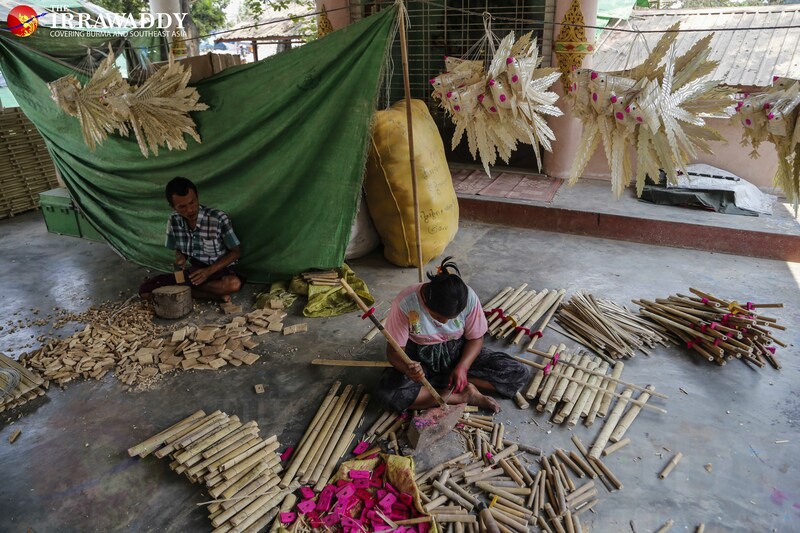 It is held for most of the month of March, with the busiest day falling on the full moon day of Tabaung, according to the Burmese calendar, which comes on Wednesday this year. 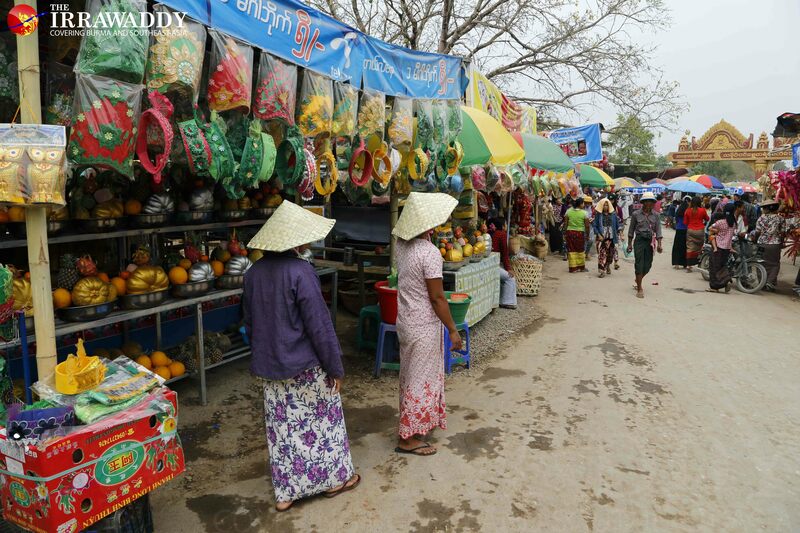 Street stalls selling local snacks and clothing lined the street leading to the pagoda, which was covered with a cloud of dust. 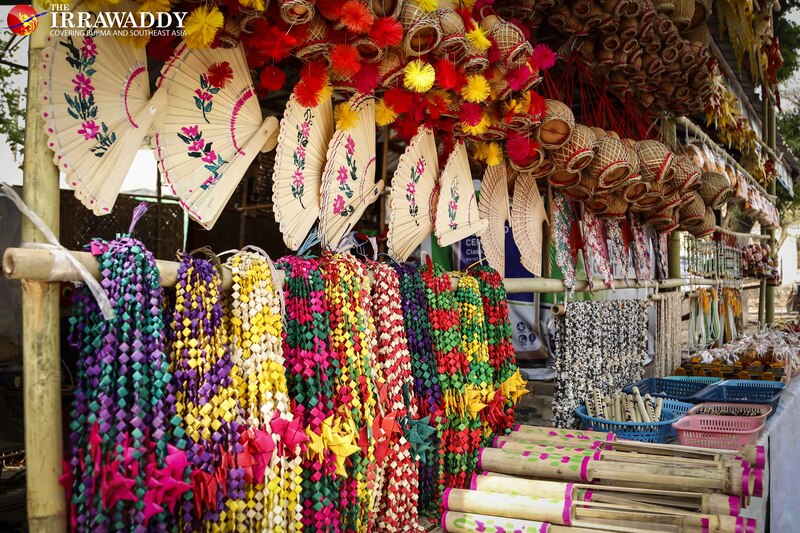 Many vendors sold the festival trademark, colorful handmade necklaces with leafy beads, woven from dried palm fronds. 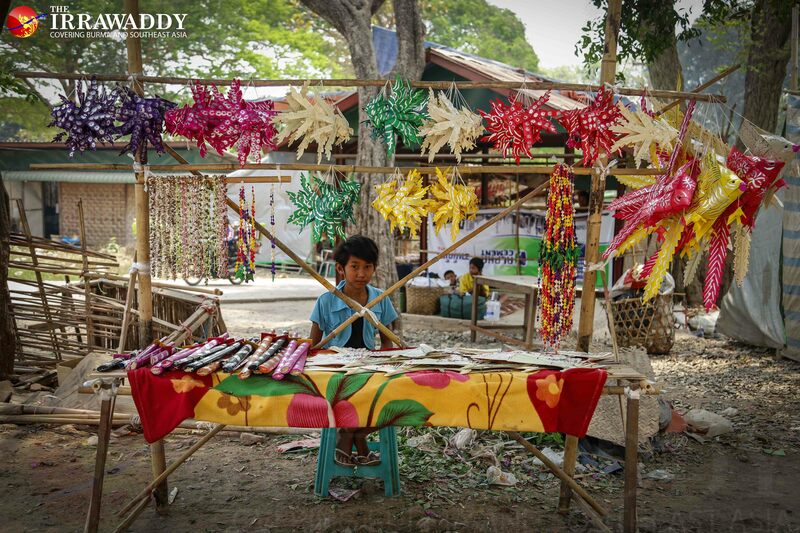 Almost every festivalgoer wore these signature necklaces, while children could be seen holding golden fish toys, also woven from palm fronds. At nearby Na Daung Kya stream, people of all ages took a dip, to relieve their tiredness and take a break from the heat. The legend of Shwe Sar Yan Pagoda, which rests on the bank of Na Daung Kya stream, a Myitnge River tributary, is a link to Pagan era, during which King Anawrahta ruled the Pagan Dynasty. 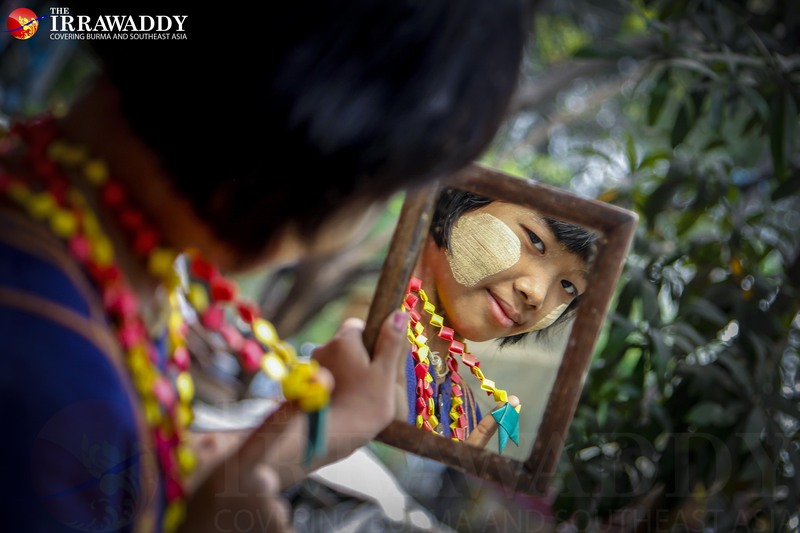 According to legend, Sao Mon Hla, a Shan Princess who later become a queen and wife of King Anawrahta, crossed a stream that flowed into the Myitnge River, on her way back to her birthplace, Sae Lant village in Northern Shan State. Sao Mon Hla built a small pagoda near the riverbank, preserving her earrings and the Buddha relic, with its façade facing east toward her birthplace in Shan State. When King Anawrahta heard the news, soldiers were dispatched and ordered to kill Sao Mon Hla if the façade of the pagoda faced east, and to set her free if it faced west, where Pagan is located. Sao Mon Hla heard the news, and in order to save herself, made a solemn wish and used her emerald shawl to turn the pagoda to face directly between east and west. 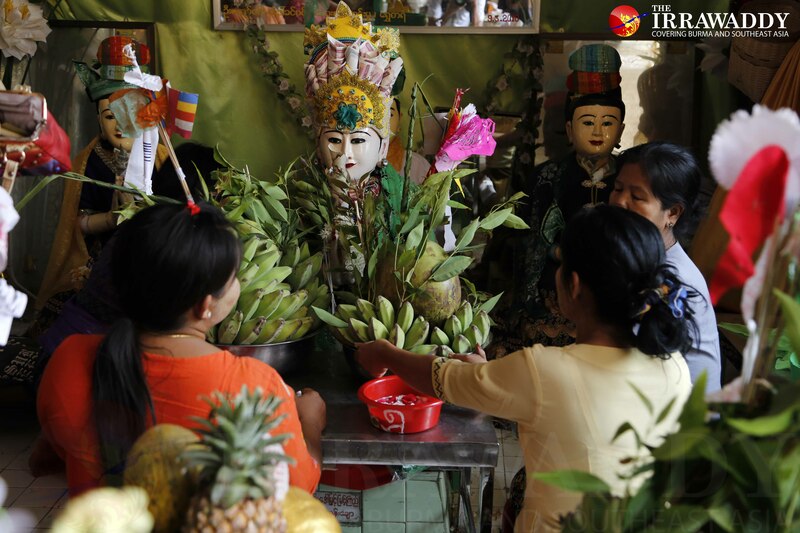 Some believe Sao Mon Hla, who passed away at her home near Hsipaw, along with her brother, became spirits who protect the Pagan-style pagoda to this day. There is a small memorial palace near the pagoda, which has a statue of Sao Mon Hla and her brother. Some people believe it is a shrine for the spirits and that if they make offerings, the spirits will bless them. Paying respect to the spirits of Sao Mon Hla and her brother at Shwe Sar Yan Pagoda has drawn more visitors than other pagoda festivals. 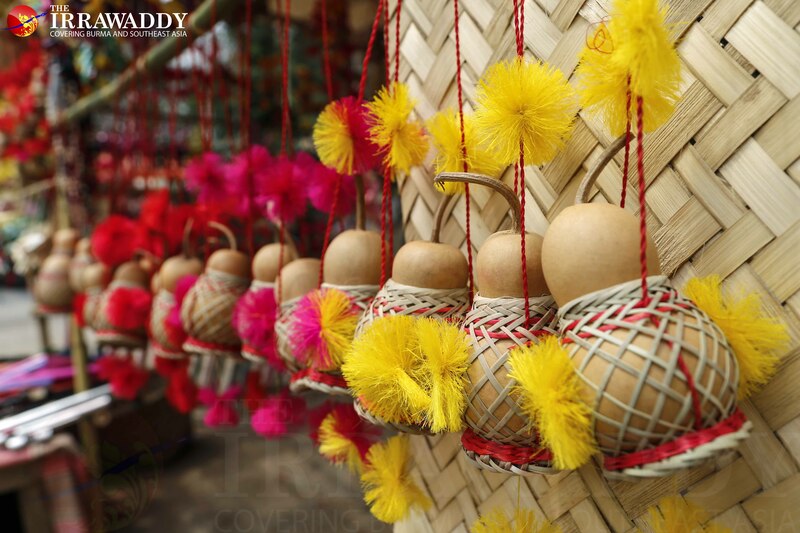 There is a local saying about this festival that says one may not accomplish paying tribute to the pagoda, especially during the festival, until enjoying a dip in Na Daung Kya stream, wearing a palm frond necklace, and paying respects to the spirits of Sao Mon Hla and her brother.